The look in my home is what I've termed "Fresh Classic". A more modern, clean, updated look with traditional bones. 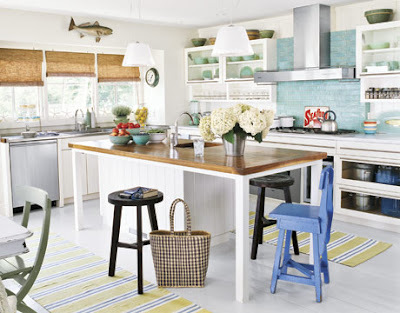 Add in a little dash of vintage and coastal and garden elements, and you have my style! I really gravitate toward neutrals with pops of fun & seasonal color. Wood floors and table will contrast nicely with light creamy colored walls and white slipcovers/clean-lined skirts on the chairs. Full curtain panels with trim at the inside edges will hang floor to ceiling. Bamboo shades will also be used. Add in color and texture with a possible sisal rug, artwork of pressed ferns, colorful fabrics & table linens, accessories & flowers. Find a vintage/antique sideboard & paint (black? a color? who knows?? ), and hang a large mirror above with artwork and sconces flanking. 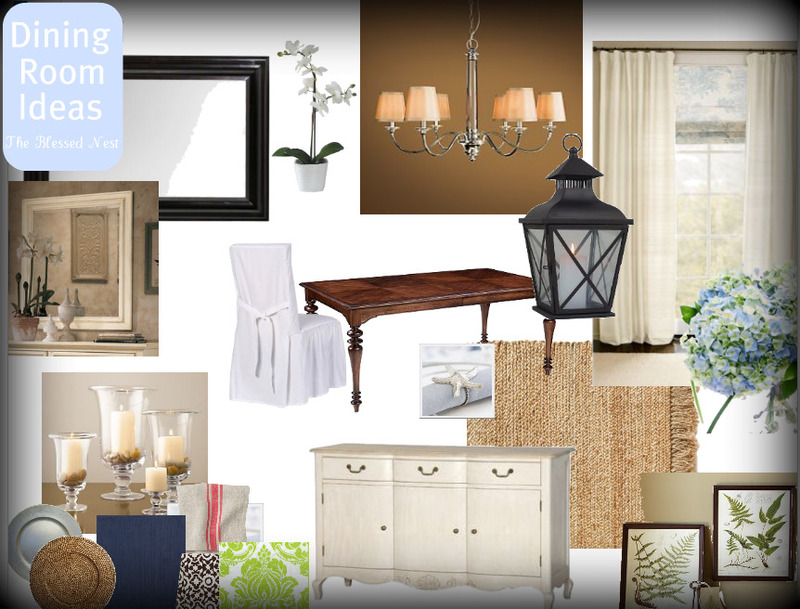 A new chandelier (still narrowing down) & lamps will go in the room too. I can't wait to get started!!! Wanna know one of my favorite things about blogging? It's getting to meet other bloggy friends in real life! I've been lucky to meet several other amazing bloggers over the past couple of years, & have found that bloggers are friendly, welcoming, fun people! It's so easy to get along when you know you already have things in common, and have already "met" each other through visiting each other's blogs. I have met bloggers from all over the country, and feel lucky to have these wonderful friends! ...come back tomorrow to see if my little experiment worked or not! Time For A Dining Room Makeover! Haaa-loooo! Time to say, "Buh-Bye!" 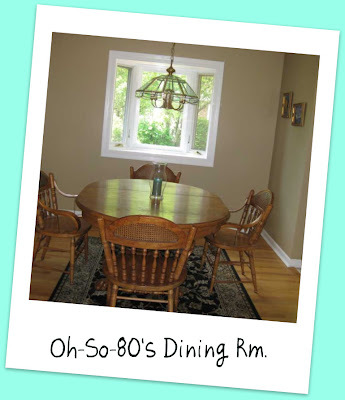 to the 1980's in this Dining Room!!! Hubby rolled on some of Mr. S. Williams's "Medici Ivory" for a fresh, creamy look on the walls. I think I really like it! I say think, because the ,um, love-er-ly chandelier in here is casting weird shadows on the walls. But our goal was to get rid of the cave like feel in here, and make this room feel much bigger than it actually is. Choosing a new light fixture & window treatments! I would really really really like to know what you would do with this space if it were your room to make over! Leave me lots of comments with your suggestions! I'd love to hear your ideas!!! This Color Is Back in a Fresh, New Way! Have you spotted it yet? The color that is making it's way back "in"? Some of you are always in love with this color, and some of you have erased it from your homes by now in favor of another. Have you noticed? I'm predicting it's gonna be "back" in a big way soon. What am I talking about? Why, R E D, of course! Don't believe me? Take a look around!! 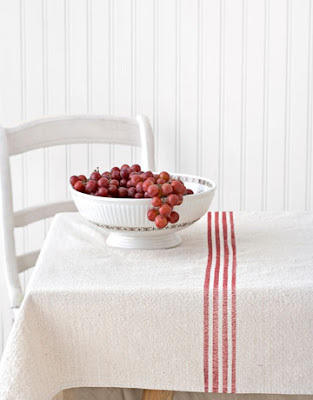 The neutral backdrop that we've all created in our homes is perfect for POPS of R E D used as an accent color! Red looks great & classic & fresh with creamy whites, but is also lovely with sand, tobacco, greys, blues, greens..... the list could go on! Good-bye stuffy, super traditional......HELLO FRESH, FUN, & GORGEOUS! 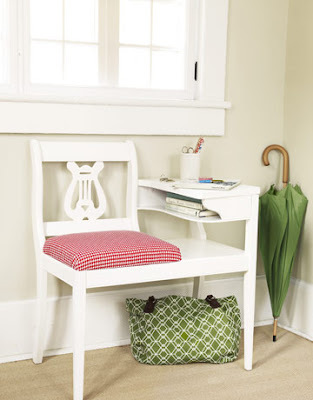 The red fabric on this white painted bench looks so fresh and cheery against the neutral, sandy painted walls. 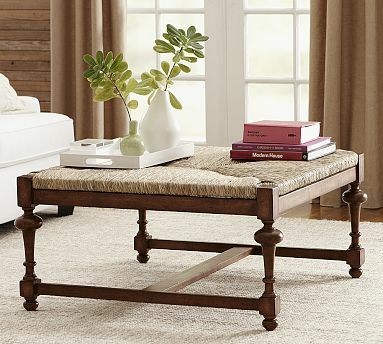 Paired with another accent of apple green and who wouldn't love this spot in their home? Red looks incredible paired with the soft blues and watery greens that we all adore right now, too! That makes it perfect to use as an accent color! Take away the red pillows from this room above and you have a nice room, but add that pop of color and the feel of the room goes from "lovely but ok" to.... "Wow, that's a great space!" Neutral backgrounds (walls, major furniture pieces) mixed with updated colors as accents gives you an affordable & fun way to change the look of your home. 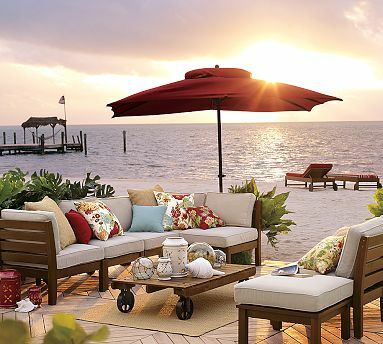 Or even your outdoor spaces! Again, paired with that blue....love that! I'm planning to add some red accents in my home for fun! What do you think of R E D? How would you use red in your home? Leave a little comment to say "Hello!" and let us know! I've found that there's more than one way to do a DIY Faux Roman Shade! 1) A Fake -- I don't need it for privacy, just for "pretty's sake", so there was no need for it to really work. 2) Simple to Make -- so many directions out there are crazy long with so many steps...ugh! 3) Looking Great When It Was Done -- 'nuff said!!! Yay! I finally got my Fake Roman Shade done today!! We're really happy with how it turned out! First measure your window & add a couple of extra inches to the width & several to the height. Since this is a stationary/fake roman shade (it will NOT be moving up & down) you can pretty much guesstimate this part. Easy, right?! :) Do the same for your liner if you want one. Next, hem the sides (sew it, or with iron on hemming tape) so that they are even with the sides of your window. My shade is an exterior mount, so I went with the outside of the moulding (though if there were space, I'd go a couple inches beyond the moulding). If you have an interior mounted shade, then hem the sides of your shade to the interior of the moulding. Fold up the bottom hem next, and do a nice 4 inch or so hem. Again, just eyeball what looks good to you. No need to hem the top since it will just be hidden anyway! Staple gun the top of the shade to a board (size depends on on whether it's interior or exterior hung -- I used a 1x3). 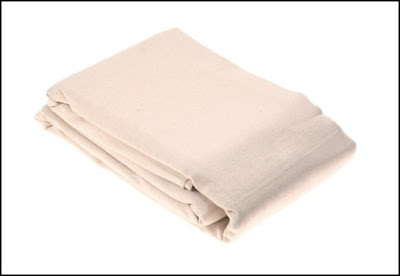 * Fold it up & hand stitch at several points. Done. * Fold it, and use a big ol' safety pin to pin it together (I've done that it the past). Easiest of all! Add L-brackets to your board, & hang, or just screw the board in the top of your window moulding. Adjust the fabric & You're Done!!! Big thanks to Hubby for hanging it for me! Making your own Faux Roman Shade really can be easy-peasy! Give it a try :)!!! The simplest way to do a Faux Roman Shade? Check out how I did it in my little girls' room here. 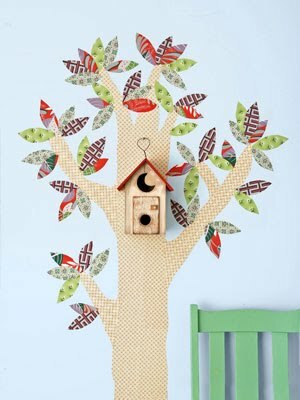 I really hope that this will inspire you that you CAN make a pretty roman shade & it can be EASY too! 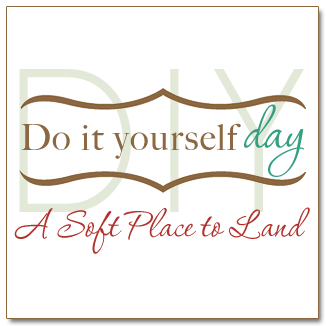 I'm linking up with DIY Day at A Soft Place to Land. "Dishing It" With New Bloggy Friends! with the goal of encouraging other women to Create A Welcoming Home! 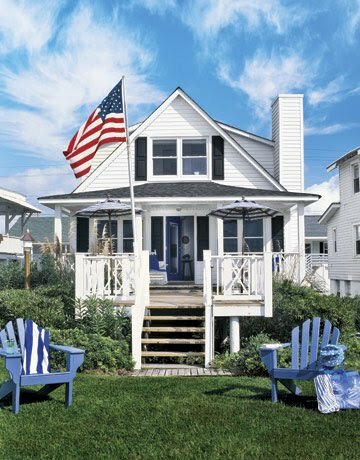 I share about making a House into a HOME, decorating, gardening, organizing, and throw in some flea-ing, projects and recipes too. A little bit of everything all in one spot! as a way of sharing with other women and also to have a creative outlet for myself. While those things are still a big part of why I do what I do, now there is also a love for this wonderful community of friends that blogging has introduced me to! I truly have met so many wonderful people through blogging! Some I have met in "real life" :) and some I have still yet to meet (someday!). I have had a fondness for birds and nests for years...goes with my love of gardening, I guess! LOL!! Plus it is another cozy word for HOME. 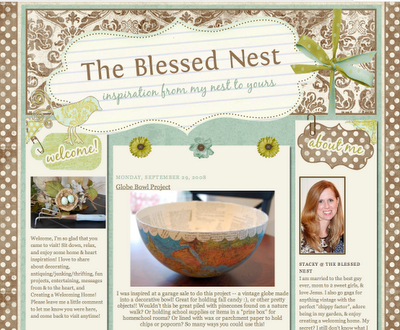 I knew I wanted my blog's name to have the word "nest" in it, but the rest of it took some thought. Finally, Hubby helped me choose The Blessed Nest because it fit so well with the way I feel... About how thankful I am for God's blessings in my life, and also because we can take those blessings, large or small, and use them to bless others. I wanted to have an encouraging title for women so they would be inspired to Bless their family and friends with a Welcoming Home! Just click on the left sidebar under "Inspiration" to read more! Ok, I seriously had fun making my very first fabric pennant banner! My daughter's teacher is having a surprise baby shower today at school and since I'm a room parent I am in charge of decorations. Perfect time to have fun and make a banner! Baby Boy's nursery is decorated in shades of chocolates & browns & greens & blues. I chose to do an extra-long pennant banner filled with all kinds of different, fun fabrics! Wouldn't this be fun hanging in a nursery or a playroom? Or used for birthday parties and celebrations as baby grows up? I love the modern, fresh fabrics so much! I actually think that this banner could be for boys or girls. That's why I'm making another like it for my girlie-girls!! I've really missed being "crafty" & think this was the jumpstart I needed to get back to having fun and crafting new projects!!! I really can't wait to make more of these! Let me also give a big ol' warm "Welcome, Friends!" to all of the new Followers here at The Blessed Nest! You're so sweet!! I'm so glad to have you here, Welcome!!! This post brought to you by my sponsor: Red Letter Words! Her artwork is so inspiring...check it out!